SAN DIEGO (AP) — A nine-time winner on the European Tour, Alex Noren of Sweden gave himself a chance to make his mark in America with a 3-under 69 on Saturday for a one-shot lead going into the final round of the Farmers Insurance. Noren finished strong, unlike some of his top challengers. He drilled his second shot over the water on the par-5 18th at Torrey Pines to the back fringe, setting up a simple two-putt birdie. Ryan Palmer had a chance to tie him for the lead until he came out of a wedge and missed the green to the right. He settled for par and a 73. Jon Rahm, the defending champion who can go to No. 1 in the world with a victory this week, was poised to get within one shot, or possibly tie for the lead. From the middle of the fairway, Rahm’s 4-iron came up short and into the water. After a penalty drop, his wedge bounced hard and through the green. His chip came out soft, and he missed a 6-foot putt to make double bogey. That left him four shots out of the lead. Rahm was three shots behind going into the final round when he won last year. 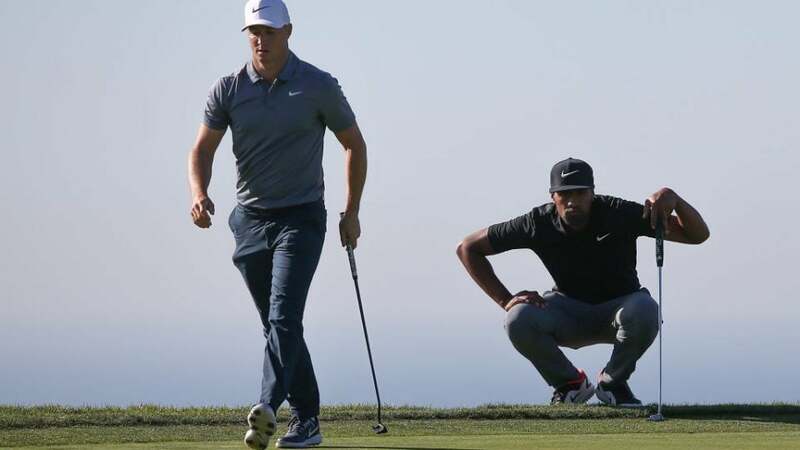 Tiger Woods was superb with his short game for the second straight day, and it’s a good thing. Woods was so wild off the tee that he hit only one fairway on the back nine and three fairways for the round. He putted for birdie on only nine holes. And he still managed to scratch out a 70. Woods was eight shots behind, in the middle of the pack. Noren, who played his college golf at Oklahoma State, cracked the top 10 in the world at the end of 2016 after a four-victory season and now is at No. 19. This is his first year playing with a PGA Tour card. Noren’s only blunder came at the tough par-4 12th, where he pulled his second shot into deep rough, and sent a wedge just over the green into a nasty lie for a downhill chip. He left that short and missed the putt. He bounced back with three birdies over the last six holes. Palmer began the third round with a one-shot lead and had two bad stretches. He made consecutive bogeys late on the front nine, and then after stretching his lead to two shots with a 45-foot eagle putt on the 13th, he made two bogeys over the next three holes. Even so, he’ll be in the final group on Sunday going for his first victory in eight years. J.B. Holmes had a 65 to reach 9-under 207 and joins Palmer and Noren in the last group. Michael Kim also was two shots behind and has some course knowledge from going to Torrey Pines High School and playing the South more times than he can remember. Noren will be leading a big pack of contenders. Two dozen players were separated by five shots, a group that includes Jason Day, the former No. 1 player in the world who hasn’t won in 20 months. Day was tied for the lead briefly until dropping three shots. He had a 71 and was three behind. Left out of the mix was Phil Mickelson, who was three shots out of the lead until he shot 41 on the back nine. Mickelson had a 4-foot birdie putt on the 18th hole that would have put him in the same group as Woods on Sunday. He missed. Woods again tees off on the back nine for the final round and is too many shots behind with too many players ahead of him to have a realistic chance. But it’s been a good week for someone playing the PGA Tour for only the second time since August 2015 because of his three back surgeries. And he certainly gave his back a good test as many times as he was thrashing out of the rough. One goal for Sunday is to give his back a rest, and maybe even try to break 70.